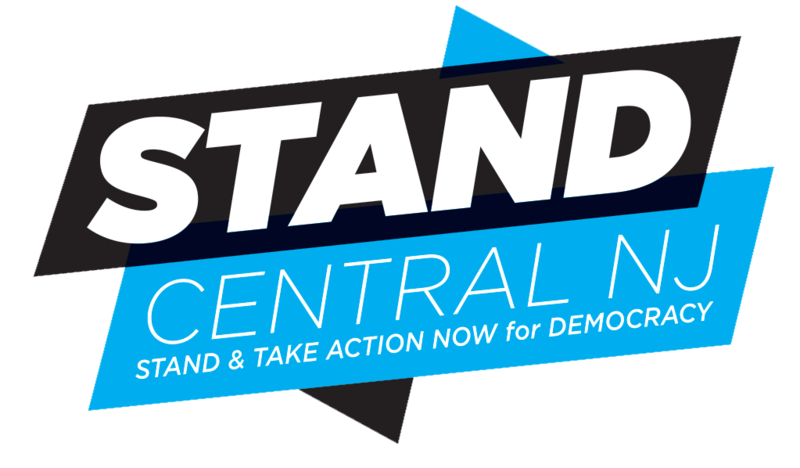 It was a busy weekend for STAND CNJ and progressive Americans everywhere. On Saturday, more than a million people attended hundreds of Women’s Marches all over the country, in major cities and in smaller locales, in “blue” states and in “red”. 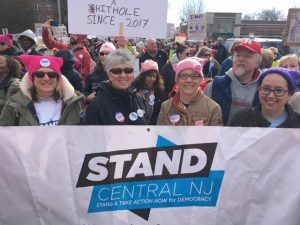 STAND CNJ was a proud sponsor of the Women’s March on NJ in Morristown, for which an unprecedented 15,000 to 20,000 people showed up! What were these marches about? To paraphrase a sign we saw in Morristown, “Ugh, where do we start? !” In other words, we marched in order to express our opposition to the Trump administration’s year-long attack on civil rights, healthcare, tax fairness, LGBTQ rights, women’s rights, the environment, government transparency, the free press, the Mueller investigation, Muslims, immigrants, and people of color. Of particular concern this weekend was the #TrumpShutdown and the White House’s sudden abandonment of a bipartisan deal to protect DACA recipients from deportation. These pressing issues are a powerful reminder of just how vital it is to take our outrage and bring it to the 2018 mid-term elections. And that was the overarching message of this year’s Women’s Marches: bring your Power to the Polls! Showing up at marches won’t make a difference unless we also show up at our polling places and get our friends and neighbors to show up too. To that end, in 2018, national Women’s March organizers aim to launch a voter registration tour of swing states and register 1 million voters nationwide, advocate for progressive policies, and help elect women and progressive candidates in the 2018 elections. This is an exciting goal, given that 2018 will see a record-shattering number of women candidates for all kinds of offices. In addition to this year’s congressional elections, there is also much that can finally be done at the state level here in New Jersey. With new governor Phil Murphy, Gusciora sees an opportunity to undo the damaging policies of the Christie administration, such as Christie’s 2016 veto of legislation that would have continued the Urban Economic Zone program. Also, New Jersey may finally be able to pass progressive legislation and actually get it signed into law! 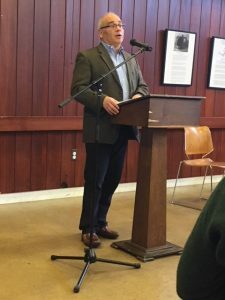 Gusciora spoke at length about the possibility of legalizing marijuana, which would bring in much-needed revenues and help to undo the school-to-prison pipeline. 2018 brings us the possibility of major change in New Jersey politics and in Congress. It’s more important than ever to regularly contact our governor and your state legislators. 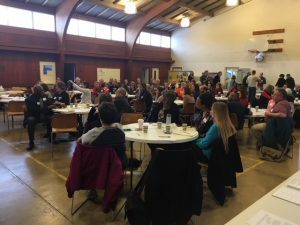 And this year, make a resolution to get involved in the 2018 mid-term elections: register people to vote, phone bank for a candidate, write postcards reminding voters about election day, donate money, host a fundraising dinner. No matter how little time or money you have, there are still ways for you to help increase voter turnout this November and elect progressive candidates. Bring your power to the polls!